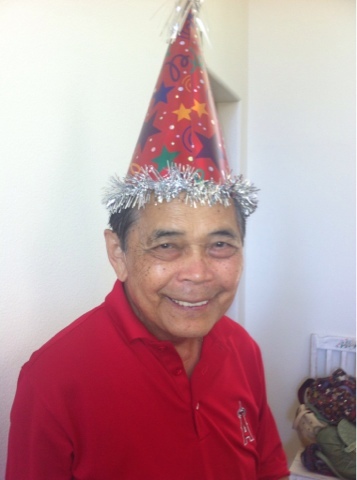 So, now it is Dad’s turn to celebrate another birthday – perhaps a little unwillingly. That tends to happen more and more as life goes along, I guess. The family gathered at his house to share his special day. Have I mentioned that my family is rather large? There were seven of us kids there (and that’s not the entire crew), not to mention the kids by marriage, assorted boy/girlfriends and grandkids here, there and everywhere, two dogs, two cats… You get the drift. It was extremely loud with all of those lives everywhere. Every table was heavily laden with food (it’s a Francisco Family tradition). Fingers big and small made music on the keyboard, and voices lifted in harmony as the organ dimly played its fading bossa nova beat in the background as we passed by. In other words, it was home. We came together in a dance so familiar to celebrate the man that unites us all. We had a great time, one that I am reminiscing about now as I sit in my quiet home – close and still too far away. So tonight, I wanted to share a few things about my Dad that still serve as life lessons for me today. 1. Small people make a big impact. When I was a child, my Dad towered over me like a giant. Dads do that. As I have grown, I have come to realize that many members of my family are “vertically challenged”, myself included. Yet, while my Dad may be small in stature, he has made a significant difference in the lives of many people beyond just our family members. When Dad moved to the States, he soon became a small town doctor. That small town doctor brought life to generations after generations as he delivered them in homes, in hospitals and out in the local Hutterite communities. Doc Eddie still reigns supreme in borders well beyond those he knows, as others live today thanks to the work he did. The magnitude can’t be measured, and it is real, meaningful and eternal. 2. You don’t have to show off to prove your worth. Dad is a genius – literally. That can be rather humbling to a kid who thinks they know it all. Yet, Dad never mentioned it… Not once. He never really touted his accomplishments; he didn’t have to. He demonstrated who he was in his actions, and others touted it for him… usually to his embarrassment. And he never made his know it all child feel down. He knew when to win, and knew when he needed to let you win. That’s a hard one for me, and I’m working on it. There’s no benefit in always being right. It’s impossible, and hurtful too. 3. Know when to work, and know when to play. Children of doctors know the routine – the early mornings, late nights, even later emergency calls from the answering service. There was no doubt that Dad was always on during the week. But Dad also knew when to call a time out. My favorite silly day, one among many, was on my twelfth birthday. I sat at the kitchen table with my homebaked cake, my brothers and sisters, wearing a cowboy hat, when a giant yell came from the stairwell. Out bounded Dad in a much too small matching cowboy hat, brandishing irons (a fork and spoon) and whooping that he was the birthday bandit. He was exhausted and on call that night, but I never would have known it. He made time stop for me and for the family. Work hard, yes, but there are times that everything else can wait. 4. Silence often means more than words. Dad pretty much does not speak. He is known for one word sentences at most, but more often – if we asked him a question – his response would be a nod, a lift of an eyebrow, or pointing with his lips. It’s a Filipino thing. “Dad, want some ice cream?” Nod. “Strawberry or chocolate?” Lift left eyebrow twice. “You got it, Dad.” He is a quiet man, but says so much without a word. I sat down next to him today, leaned against him, put my head on his shoulder – and with one simple pat on my hand, he said more about how he felt and his love than a million flowery poems or this blog ever could. Words are often overrated. Dad shows his love instead with a gentle touch, and through his endless cooking of pots of adobo, plates of pancit and piles of lumpia. You never go hungry, belly or soul. People show love in different ways. How open are you to receiving it? 5. Don’t forget to dance. We are pre-iPod, CD and cassette. Yet, Mom loved music on at all times (probably to mute the sounds of us crazies), so Dad installed a radio in the kitchen, hanging underneath the cabinet. It would play in the background every night. Then, after the food was gone and the dishes washed, magic would happen. Several nights a week, a song would come on that Mom loved, and Dad was swoop her into his arms, waltzing her around the kitchen in a grandiose arc. Then, he’d pull her close to him, sway softly and sing Julio Iglesias or “Dahil Sa Iyo”gently as an eerie quiet would fall over us all. Life goes by too quickly, and the days run together and are soon forgotten. Yet, those fleeting minutes are magic. Don’t forget to dance. Here’s to you, Dad. Thank you for the food, the Angels, the unexpected piano concertos and the karaoke marathons. Tags: Business, Career, Dad, Dahil Sa Iyo, Family, Filipino, Impact, Life Lessons, Love, Wisdom, Work Life Balance | Permalink.